I was looking forward to visiting Atlantis Aquaventure. 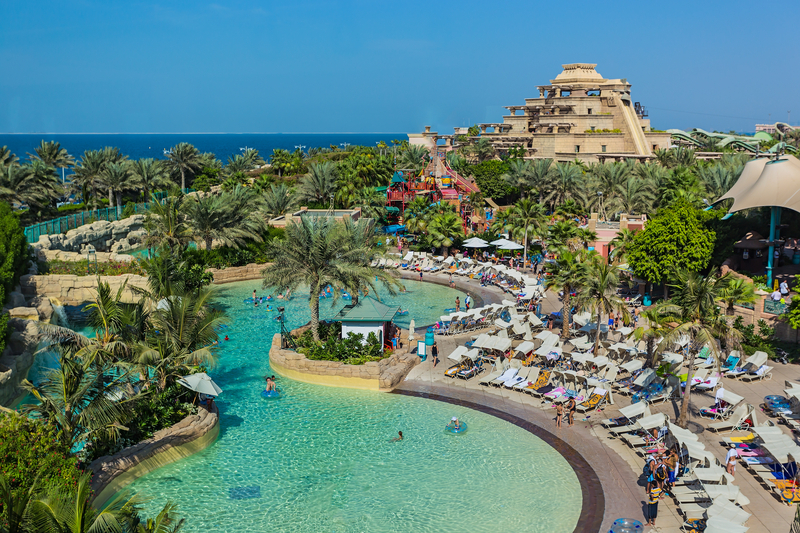 It’s the largest waterpark in Dubai with over 42 acres of fun! 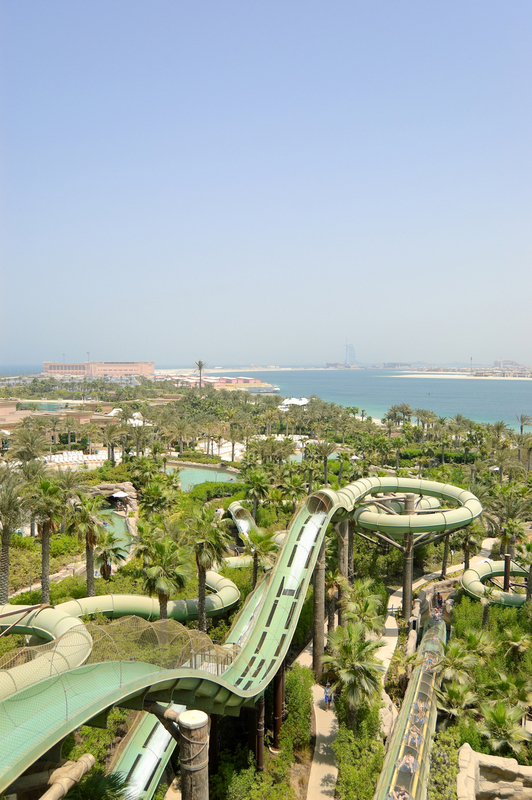 My kids LOVE the water and I wanted to check out the slides with my kids in mind. 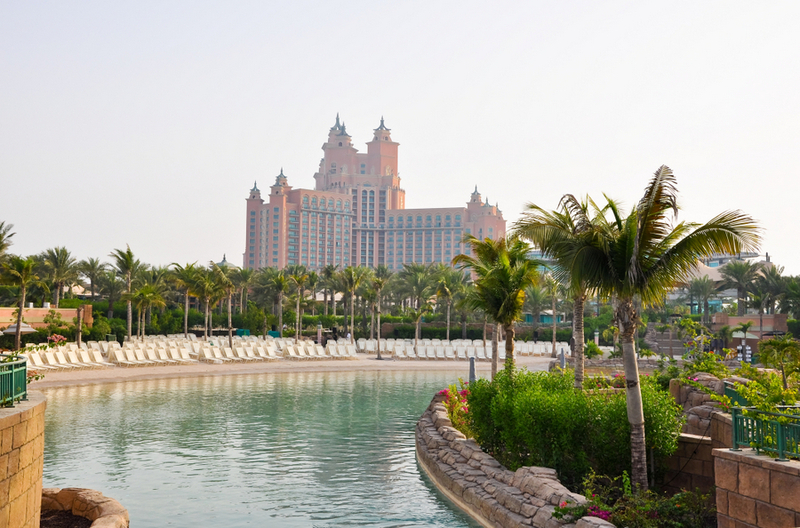 Atlantis The Palm Resort and the adjacent Aquaventure Waterpark are located on the artificial (and rather incredible) Palm Jumeirah Island. 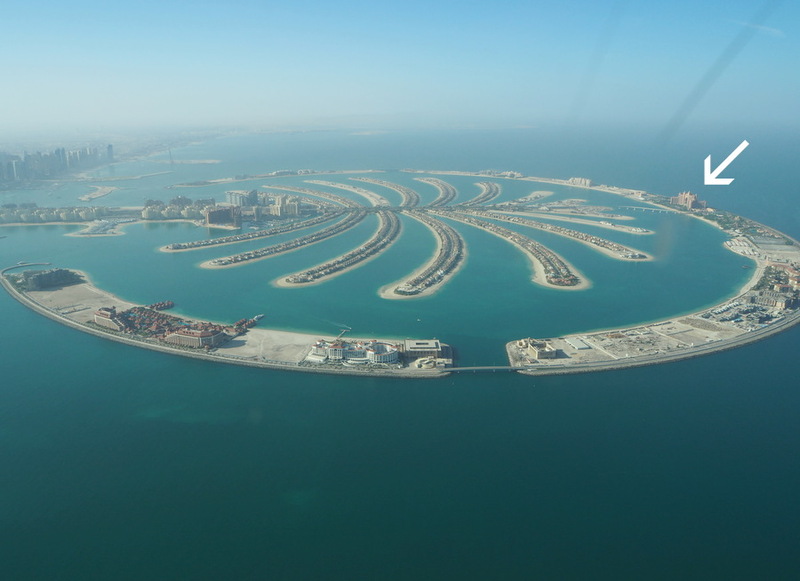 You can see where Atlantis is on The Palm in this picture my friend Deb took while on a seaplane tour. (I’ve marked it with an arrow). I thought I would know when the island began but it’s seamless; I had no idea we had left the mainland until our guide from 1001 Events mentioned it. After researching the size, I discovered the trunk part of the island is an eight-lane motorway and each frond is close to 2 kilometres long. 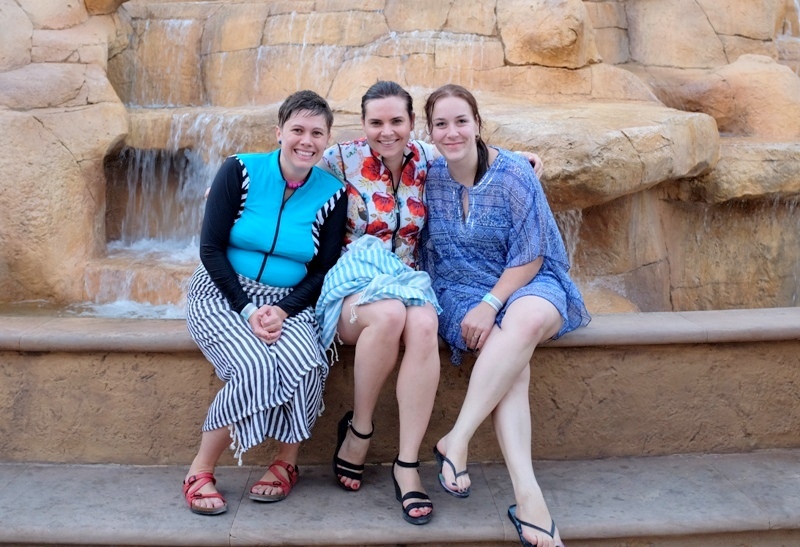 By the time our group arrived at Aquaventure we had just over an hour to explore the waterpark. 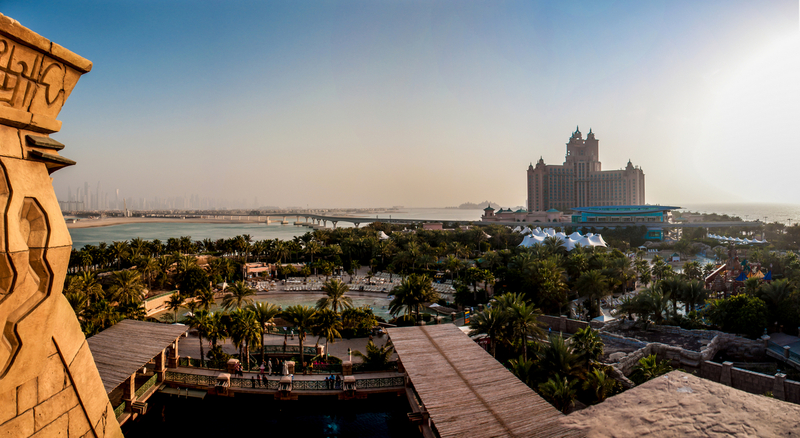 This was my last full day in Dubai, and I felt a sense of urgency to make the most of it. I didn’t expect it to be as much fun as it was. I ended up with Deb from Learn With Play at Home and Sam from School Mum and together we frantically raced up stairs and didn’t really consider WHAT ride we were gong on, and just did everything and everything we could. It was hilarious! I laughed so much! Perhaps if I had more time, I wouldn’t have been quite so brave. 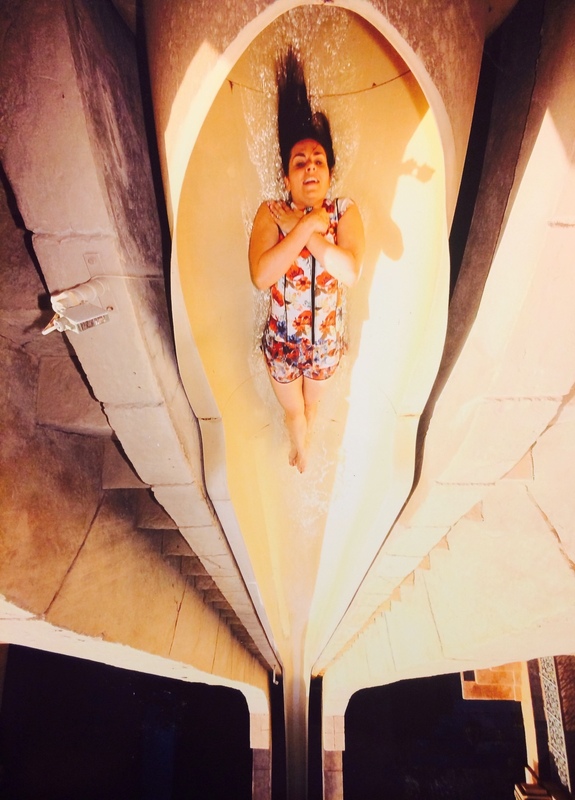 I didn’t expect the famous The Leap of Faith slide to be quite so…um…steep! That’s probably a good thing. 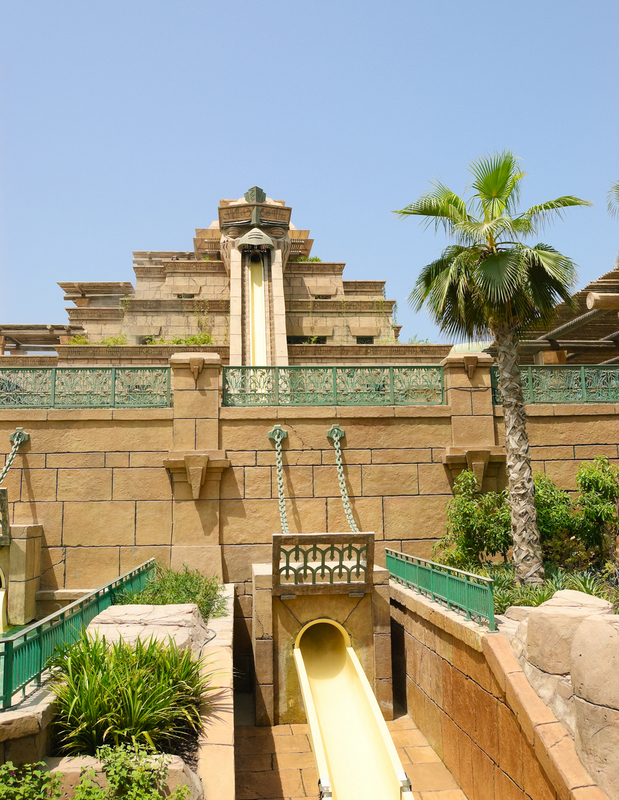 Located at the top of The Tower of Neptune, The Leap of Faith is a 27.5 metre tall and 61 metre long slide. 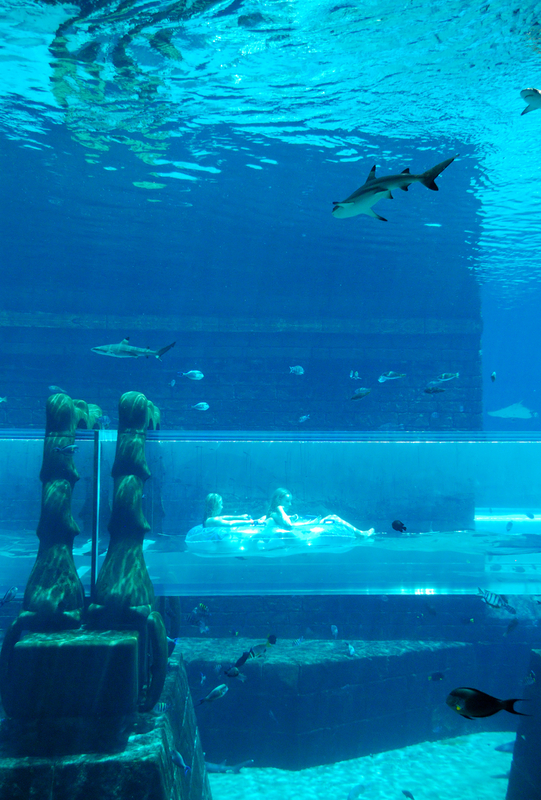 It throws you into a transparent tunnel and through a shark-filled lagoon, where guitar sharks, bow mouth sharks, white tip, black tip and grey reef sharks swim. This is what you see from the bottom. Yeah, looks fun, right? 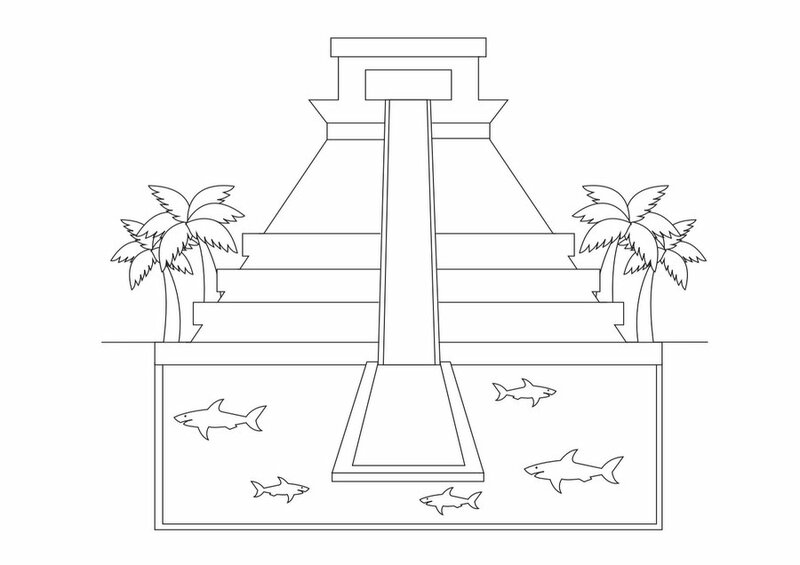 Then this is at the bottom: an aquarium. That’s pretty cool. Unbeknownst to me in my let’s-do-as-much-as-possible-state, THIS was the ride I was going on. I’m glad the camera didn’t take a picture moments after…when I dropped. It was FAST. It was scary. It took the breath right out of me! But I’m so glad I did it. 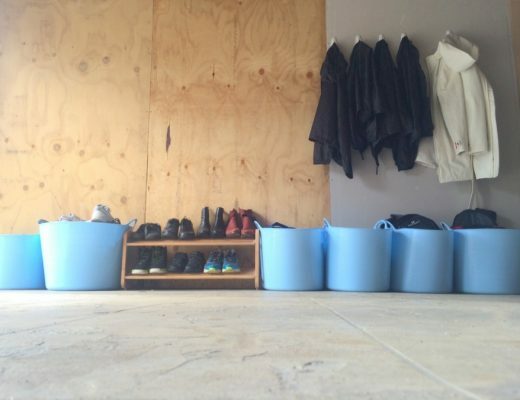 It was a bucket moment for me. 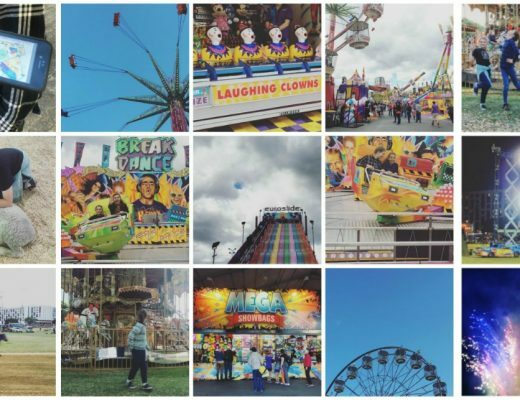 A family could easily spend all day here, and there are a lot of different rides and spaces for different age groups. Splashers is a section of the park designed for younger children with water games, slides and climbing structures and a 1.2 metre slide. 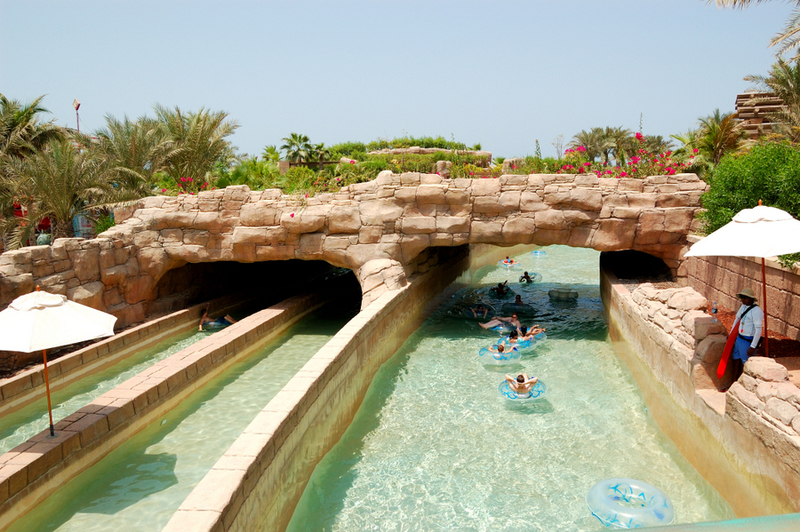 Another fun feature is the 1.6 kilometre River Rapids. It meanders through slow and fast periods. This place in my top three places to visit in Dubai as a family. I wish I had time to explore this place more: there are pools, many, many slides, the ocean and sand play area, The Lost Chambers Aquarium and much more. 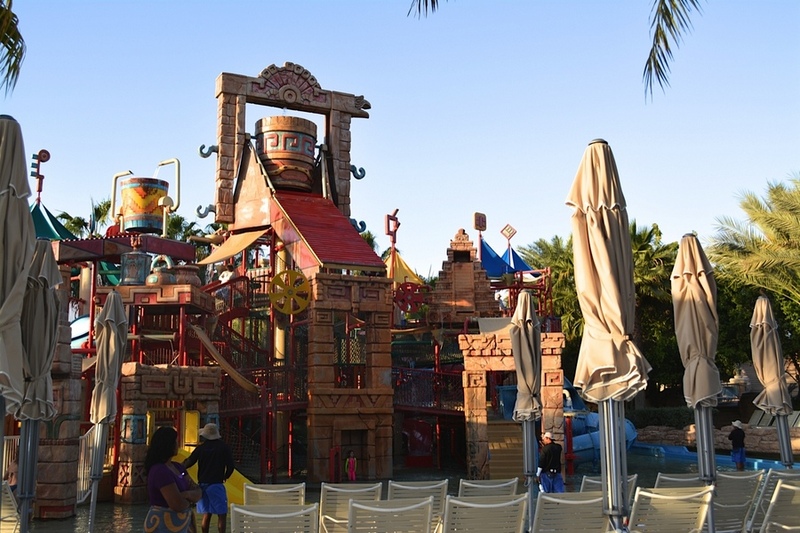 Read more about the Aquaventure Waterpark. 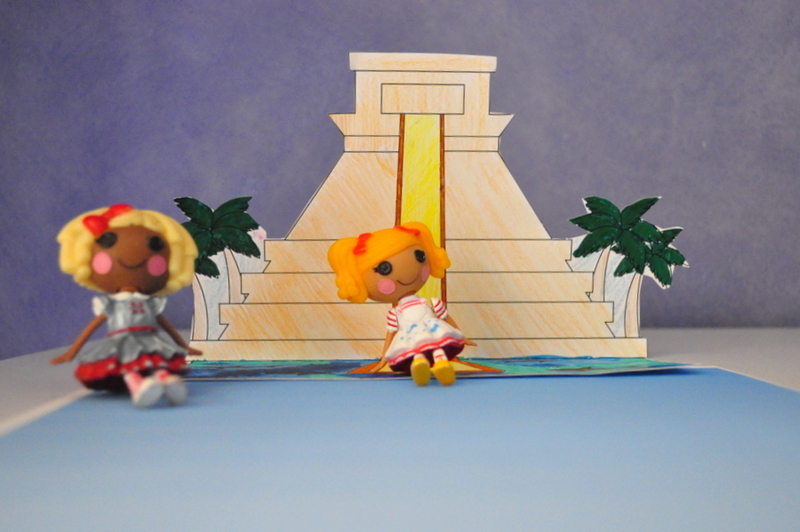 Here’s a simple Aquaventure-inspried activity for the school holidays. 2. Colour in and create to create a backdrop for play. 3. 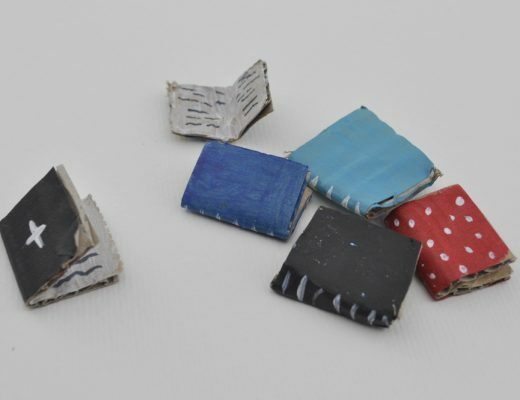 Fold at the line. 4. I added a blue base (the pool area) by inserting a large rectangle shape into Word, making it blue and then printing it out. I agree, the fact that we did the whole thing running around meant not enough time to actually think too much about the rides we were going on! We were so brave haha. Sounds like heaps of fun. Having been to Dubai recently, I’m interested to read this post. Makes me want to take my kids back ????! That looks pretty awesome! Bet your kids are jealous. Oh my – best. pool. ever! That has got to go on the bucket list! I paid at the counter (as you leave the waterpark) and they gave me a code and website to access them online so you can print them when you want etc.